This class represents the base class of a number of IR nodes define modifiers within the C++ grammar. Modifiers are use to add suplimental information to types and declarations and other IR nodes within the C and C++ language (const, volatile, public, protected, private, etc.). There are no uses of this IR node anywhere. All SgModifier based IR nodes are derived from this SgModifier class. Definition at line 10375 of file Cxx_Grammar.h. This constructor builds the SgModifier base class. 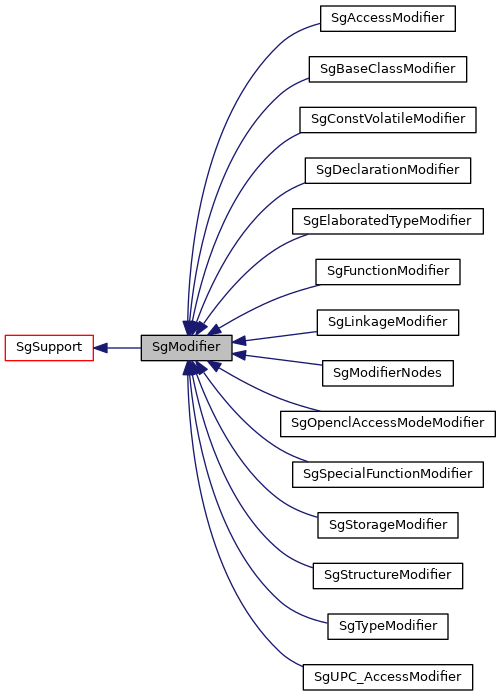 Reimplemented in SgOpenclAccessModeModifier, SgDeclarationModifier, SgTypeModifier, SgBaseClassModifier, SgLinkageModifier, SgElaboratedTypeModifier, SgSpecialFunctionModifier, SgUPC_AccessModifier, SgFunctionModifier, SgAccessModifier, SgStorageModifier, SgConstVolatileModifier, and SgModifierNodes. This is a simple assignment of the SgBitVector from X to the current object. Cast function (from derived class to SgModifier pointer). This functions returns a SgModifier pointer for any input of a pointer to an object derived from a SgModifier. Returns valid pointer to SgModifier if input is derived from a SgLocatedNode.